So this happened yesterday on Twitter. The original poster has since “surrendered” and admitted he was wrong, but he’s likely not the only person operating under the assumption that libraries are unused spaces. That couldn’t be further from the truth. Though I live in a very small, rural community, my local library is almost always filled with people when I visit, which I do nearly every week. Though our small library only has a tiny collection, I have access through inter-library loan to any book owned by any library in the state, and I make use of that. I also download ebooks and audiobooks through my library. Picking up my weekly read is often the highlight of my week, as libraries, to me, have always been relaxing, peaceful places. My library is the place I go to “detox” from the increasingly toxic world around me. 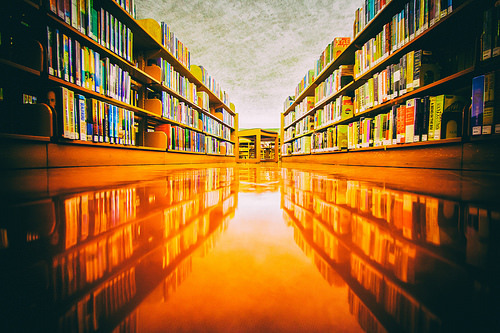 Even in college, heading into the stacks on one of the school library’s quiet floors was one of the only ways I could calm myself in a panic attack. Just being among the books was soothing. There’s nothing like the smell of old books. And for me, that scent is associated with safety and warmth and happiness. In a lot of ways, the library made me who I am today – with, and thanks to, my grandmother’s assistance. She was a regular library patron and as my caregiver while my mother was at work, I went with her to the library every week from a point long before I was actually able to read. As soon as I started to recognize letters, Nanny would allow me to pick out three books every week to take home. It’s thanks to her I was reading novels by kindergarten. My grandfather sat on the library board, too. Though neither of my grandparents had more than a high school education, they constantly educated themselves through extensive reading. I was always surrounded by books at their home (now my home, still filled with books). I don’t know that I would have become a writer without my library and access to all of those wonderful books. I don’t know that I would have developed the love of reading that caused me to major in English. My library didn’t just provide me with things to read, it had a decided impact on the course of my life.